I have been aware, since the beginning of my journey in witchcraft, that there have always been people who like to make-believe that they are Dark, Spooky, Ancient Witches. Fueled by popular books and horror movies, this niche of people brag loudly: “I'm not afraid of death and darkness,” “I'm not afraid to make blood sacrifices,” and “I'm not afraid of cemeteries and bones.” As I roll my eyes, I also assume that they aren't afraid of decorating their homes with black candles. But alongside the more amusing of these role-players exists a number of people who take their hobby further into a realm I'm both annoyed and disturbed by. Countless times during the modern witchcraft revival there have emerged thrill-seekers and rebels who, typically accompanying acts of childlike defiance, eventually commit crimes and abuses time and time again, like a child who kills animals when young and grows to abuse humans in adulthood. This phenomenon is worrying, yet seemingly ever-present. There has been a recent controversy that has sparked me to type these words. When confusion arose from the general public, some experienced Priesthood in one of the oldest and most mature lines of modern Witchcraft said simply, “No, witches do not sacrifice animals.” I'm sure those asking the question were relived by this response which surely represents the majority opinion, but a light will always lure moths. In nearly every forum where a witch stated animal sacrifice has no part in witchcraft, there were half a dozen “Traditional Witches” demanding acceptance for their niche hobby. Those who capture and kill crows, surround them with spooky, store-bought candles, and snap pictures for Instagram passionately disagreed and demanded the statement be revoked. Those who once bought a tiny mouse from PetCo and then chopped its head off as a Grand Sacryfice to the Hornyd One bumbled their way across the keyboard in defiance. To my surprise one Praktytioner of the Arkane Arts even captured wasps and squashed them to make her magyck work. What insidiously grew from my annoyed amusement was a startled concern: the same people I assumed were harmless (except to small helpless animals) began to threaten my close friends and I over messages and posts. As the flames grew higher phone calls were directed to my friends' house threatening violence. The same people who were being defended as “just good people who commit earnest sacrifice, as people have always done in the past” showed their true colors simply because people dared to disagree. A retrospectively amusing case of this same type of Wytcch was “The Highgate Vampire,” who was eventually arrested in the 1970s for vandalizing and desecrating Highgate cemetery and mailing threats and spells to people. He began his career as a Dark and Spooky Wytch with hijinks and petty crimes galore, which mostly consisted of distracting the police from more important work. What eventually happened to fulfill this man's yearning for the feeling that he was a True Witch was the destruction of sacred property and the instilling of fear in many innocent people. (He is now an earnest spiritual person and has left his crimes in the past.) In comparison to similar figures in the past, it is obvious that these people need to put down the dagger, pick up the phone, and make a call to a good psychologist's office. Many of my elders in witchcraft have written about the same sub-genre of witch from their personal experiences. They describe people so desperately attempting to possess some form of power over their lives and the lives of those around them that they inevitably turn to heinous and evil crimes. Animal abuse, sexual harassment, sexual abuse, and even kidnapping soon followed these taboo-pushing “rebels.” Many people began as “witchcraft outsiders” who claimed to be genuine spiritual people and then very quickly began to lure, manipulate, and abuse those who joined them in their rites. I am not disturbed by the fact that there are people who kill animals; people have always killed animals for food, survival, or genuinely old religious traditions in reverent and community-based manners. What really disturbs me are the demands made by these modern wytcches seeking to bolster a hobby that is done for thrill or some form of questionable spiritual reassurance... a hobby which the majority of people are turned-off and concerned by... and the fact that the misbehavior and threats surrounding this hobby are highly reminiscent of what many abusers in the occult world have done in the past. One of the main grabs these rodent-squashers make is that “Witches all over the world have always sacrificed animals.” I really wish it was obvious enough why “Because someone in the past did it” is an entirely fallacious excuse for present behavior, but sadly I will have to make it more clear for those in the back. I am talking about witchcraft, not magic, and as such these issues of sacrifice become much more pronounced, especially when popular movies and TV shows are still inspired by the witchcraft lore of Early Modern Europe. It's quite obvious that witches in the past are said to have sacrificed not only animals, but humans and infants. Around a blazing fire in a dark forest wail haggard old women, and beneath their shouting cries a terrified baby moments before its murder. A witch is seen holding a knife to the flesh of a newborn, moments later pummeling the corpse to a pulp, and then smearing the gory remains on her body. These folkloric sacrifices were terrifying to people hundreds of years ago, and still are when portrayed in film. As no stranger to horror stories and cinema, let alone the folktales of fictional witches of the past, I have no objection to these portrayals. They are inspired by historical folklore and portray fascinating archetypes of the ante-mother, the fear of infertility, women's sexual power, and the anxieties of parents in the protection of their offspring. These are primal ideas which must be explored, and fine by me if they are explored through the Witch. But when Tradytionael Wytcches make a lifestyle out of looking back at old folklores and pretending that they are true portrayals of an ancient witchcraft, I am worried. Not worried that they will sacrifice babies, but that they will eventually do anything to satisfy their desire for something “real” in their life. On the bookshelf of many a Traedytionael Wyytch can be found stories from the times of the witch persecutions, and even modern books by people pretending to be a part of that historic folklore. These older books (in rare instances) call for the sacrifice of frogs, birds, goats, dogs, and black cats. The idea is, spurred by reductive, white anthropologists in the 20th century, that all folk magic is equal to witchcraft (a proposition that is still denounced by many a historian) and thus any old spell that was recorded is somehow witchcraft. A well-known spell to bring rain required a black cat and the sea. The witch would take the cat, toss it out into the sea, and when the cat swam back, would repeat the process over and over again until, stricken by exhaustion and cold, the cat would give up and drown. An animal sacrifice for a magical outcome. Yet this practice, especially because of its prolonged cruelty toward the animal, would get anyone fined, arrested, and jailed today. These are the types of outdated practices Tradytional Wytches are defending simply because they are old. Similar sacrifices are made by modern Dark Scary True Wytches, frequently utilizing helpless small animals, and are often photographed afterwards, overlaid with spooky filters, and the trophy posted online. The bones of the slaughtered animal are often then amassed and laid out on altars, which are further photographed, filtered, and posted online. There is an unpleasant pathology here that stems partially from the unwarranted glamorization of past, and eventually extends to actual physical abuse and/or bloodshed by those who claim to be living the life of a witch. This is not simply hunting or farming, this is disturbing. The fact that it is being normalized and made on-trend by "Traditional Witches" on the internet is disgraceful and disillusions me greatly as to the creative merit of non-lineaged, non-traditional witchcraft branches (however “Traditional” they nevertheless claim to be). The sensational animal killing by troubled and disturbed teenagers in the 90s is now being actively justified by people claiming to be witches... because they read it in a book. What kind of behavior is subsequently accepted when people justify violent acts because they feel it is “just spiritually right?” What kind of sacrifice is permitted in the name of “Old Fashioned Witchcraft” when customs are built from the ground up out of antiquated folklore, and then where are the lines drawn? I think it goes without saying that whoever aligns themselves to these silly, abusive, and pathological practices are not on my side and do not have my support. Animal sacrifice is not a “traditional” aspect of witchcraft, no matter how many people make-believe it is. These types of dedicated role-players are jokes, until they are not. I don't intend to embrace these people as Priesthood or Witches for the same reason I don't embrace the Westboro Baptist Church as Christian. When you invent your own spirituality and the invention becomes distasteful to hundreds or more people, don't be surprised when you aren't invited to the party, and when your demands for acceptance are not met. Unfortunately for all of us, these people tend not to be good people. Fortunately for me and the rest of Witchcraft, they are also not real Witches. "Occult Revival" Reviews Austin Shippey's "Praesidium"
Check out the full review at Occult Revival Book Reviews! Lady Sheba was an American Witchcraft celebrity for a moment in the 1970s. Her books still sell well today and are an alluring glimpse at British Traditional style Witchcraft wrapped in a vintage, charismatic package that makes one imagine a cheerful woman burning magical herbs in a censer, mixing flying ointment out of hand cream, lovingly placing an Avon Goddess figurine on her personal altar, and carrying a candle into the backyard under the full moon. For that brief moment in the 70s she helped register Wicca as a genuine religion and ran covens herself, forming her own tradition of witchcraft based on older traditions. I've read simple paragraphs in memory of this memorialized witch from her family recalling how she had an herbal cure for just about anything, that she was seen as strange by some yet was loved by many others. Yet like many other witchcraft elders Sheba and her work were not without flaws. For as charming as her books can be they are rife with material stolen from writers like Doreen Valiente, and for these writings the authors received not a dime or credit, not even in revised centennial editions of her books. Simply put, Carl Weschcke of Llewellyn publications, along with Lady Sheba, made the conscious decision to publish work which was not theirs to publish and which they had no involvement in bringing about. We don't know exactly how they received some of these works, but there are a couple plausible theories—what we know is that Lady Sheba obtained material from various sources and published them without permission. Personal poetry and simple rituals treasured by many and held as true religious mementos are now, because of them, sold in bookshops to be either praised, gawked at, criticized, or repeated by untrained hands who don't have the full picture. In publishing her books Lady Sheba betrayed the trust of all of her elders and so many who worked so hard to hold those beautiful words and rituals to the standards they deserve: lovingly passing them down and not selling them for $10 on a bookshelf. In making a name for herself and Llewellyn Publications they betrayed a magical bond on a very human level, let alone one of potent magic. Was this new strategy for an occult tradition one of American Freedom, or of American Consumerism? Did it remedy the limitations of a small and personal initiatory cult, or nurture and fertilize a newer mindset of entitlement and a fast-food, I-want-it-now approach to Witchcraft? As evidenced by the mass approach to witchcraft common today, I unfortunately have to side with the latter. Lady Sheba's books, some first edition, some centennial, sit on my shelf. When I shuffle through the pages and smell that old book smell and see the smiling woman printed in black and white along with her simple magical instruments, I know that Jessie Wicker Bell, Lady Sheba, was a truly magical woman. I only wish she would've used her moment and her magic more wisely and followed the advice of the words she so vehemently published. 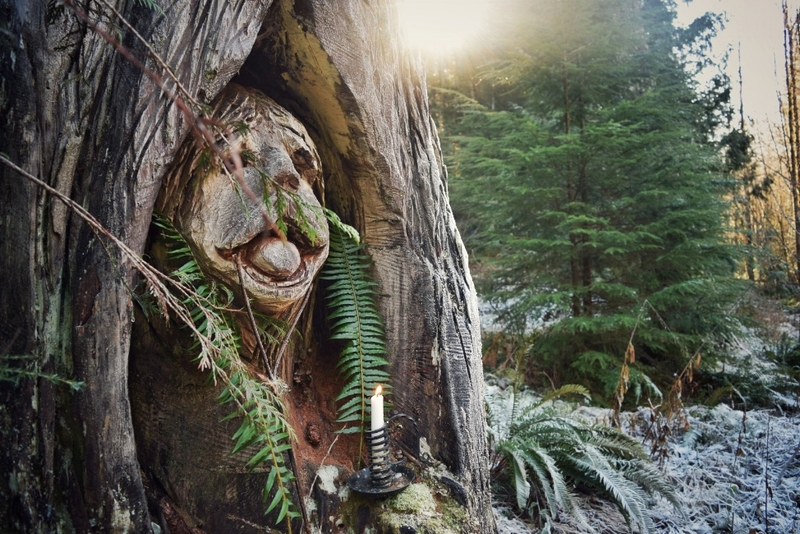 This winter, during a beautiful trip to a mountaintop cabin, I discovered a face carved into a tree, looking toward the house. I sensed power and protection in this face, and knew that many people had stumbled upon it before, and many more would in the future. 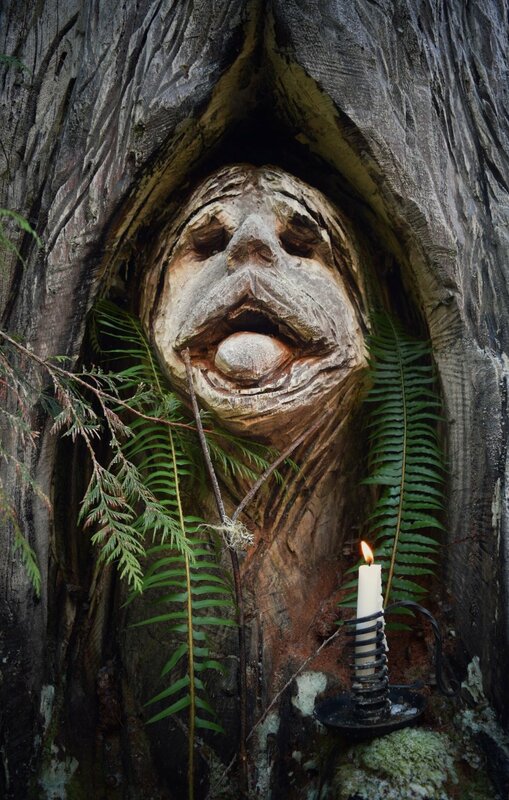 As a way to give thanks to this figure I adorned it with things I collected from the surrounding forest, and let a candle burn for it. Who Were the Cunning Folk? A large reference for this article has been Owen Davies' book “Popular Magic: Cunning-Folk in English History," one of the most concise and well-written histories on the cunning folk. The cunning folk were healers, diviners, and practitioners of Christian folk magic in Europe from at least the 15th to the early 20th century. For over five-hundred years the cunning folk worked to provide magical services to local populations and sought out obscure knowledge through books and experimentation. They worked hard at their jobs, were entrepreneurial, and on occasion travelled many miles outside of their town to stay with someone in need of magical aid, healing, or simply a reassuring person to talk to. The cunning folk of historic Europe are an unshakeable influence on and early precursor to all of magical spirituality today. “Cunning Folk” is a term used by historians to describe both male and female professional practitioners of magic in Europe. These cunning people were physicians, healers, psychics, magicians, and providers of magical services to their clients. The cunning folk were the wise women and men. In the cunning folk’s historic society eclectic knowledge and wisdom was key; the cunning folk were seen by the population as distinct in society for their knowledge acquired from either a supernatural source, a hereditary ability, or from their literacy, as many people back then couldn’t read or write. They were central to the experience of the magical world for the majority of people; and almost everyone knew at least one cunning man or woman. When you think of magic in Europe, you are most likely to think of witches and their Sabbath in the woods at night. Although cunning folk were referred to in rare instances as “White Witches”, in Early Modern Europe the cunning folk were seen by the majority of the population as very distinct from witches. 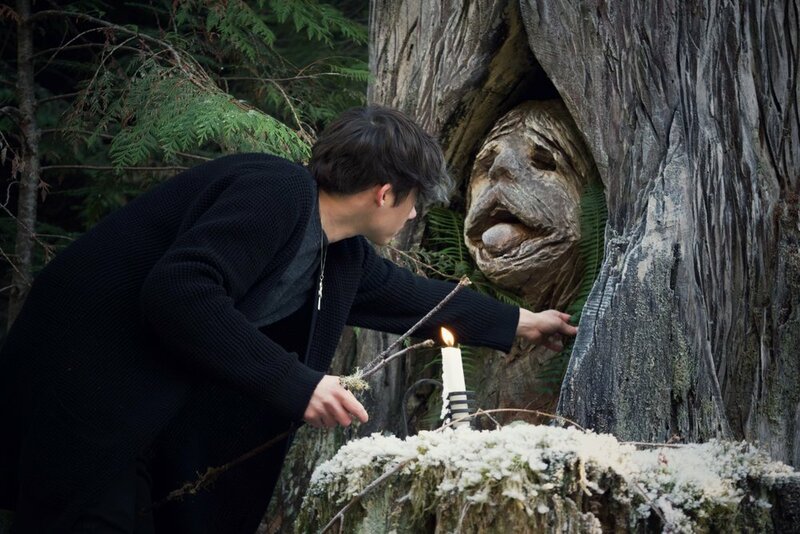 Cunning folk tended to work alone, using Christian names of God in their magic, reading from Christian grimoires, and utilizing Biblical verses. To them magic was a helpful tool which accompanied their Christian religious beliefs rather than composing them. Many today attempt to mystify or glamorize the cunning folk as “the true historic witches." Outside of fantasy the cunning folk were ordinary, if only a bit kooky, people who could read and developed an interest in magic. They sent for mail order books, studied up the most popular of them, in some cases even just bought the books to look impressive on the shelf. Witchcraft was persecuted because it was seen as heretical and diabolic, where cunning folk were safe from persecutions. In fact, the same grimoires used by the cunning folk were brought into circulation largely because so many Catholic clergymen studied and practiced with them. Cunning-craft differed from witchcraft and witches in the religious sense as well, because witches were seen as believing in a mix of devil worship and paganism, as flying to their Sabbath with the goddess Diana and meeting with the Devil, and the witches' rituals were seen as heretical and often criminal. Where the cunning man worked alone in his home, witches travelled to a Sabbath to meet with a coven. They were seen as anathema to the Christian God, whether this meant paganism or diabolism. The classical Grimoires were not seen as the domain of the witches as reading and writing was seen as a pure, Godly act mastered only by nobility or clergy. The cunning folk, not commonly charged with heresy, were for the most part safe from the witch persecutions, because even if the church didn’t always approve of their magical practices they were still not seen as diabolic or heretical and were therefore not under the church’s authority. The cunning folk’s magical practice was generally self-taught and learned from grimoires and magical texts which were purchased by mail-order to be used by those who had the advantage of being able to read. They practiced low magic otherwise called folk magic. Magical practice was not a means to gain enlightenment, but to solve everyday problems. The cunning folk were some of the first professional psychics in history. They would often run their businesses out of their homes. They would set up a lobby at the front and then a parlor room in the back. Clients of the cunning folk back then wanted to know about practical things. Their farm animals, their families, their neighbors, their love life, etcetera. Another thing people often went to a cunning person for was to detect a thief. They could receive better results this way than through any of the legal systems. For this problem the cunning folk had many ways to divine the identity of the thief. One of these methods was scrying in a bowl of water, a black mirror, or even urine. The cunning person would have the client pee into a container and if bubbles formed in a certain way on the glass it could indicate the curser’s identity. If someone had reason to believe they had a curse placed upon them, and they approached a cunning person for help, there were three ways the cunning person could go about the situation. The first was to go to the source of the harmful magic and tackle the witch physically or through the courts. The second was for the cunning person to break the spell at a distance via magical rituals and spells. The third was by using a mix of charms or herbs to cleanse the victim’s body of the negative attached energy. Sometimes a combination of all three of these would be used until the ailment disappeared. One way to tackle the witch was by “scratching” where a client was told to find the person they believed to be the witch, scratch them with their fingernails, and if blood came they would be healed of the curse’s magic. If no blood came, either the person wasn’t the witch or they wouldn’t be cured of the curse. This of course caused a lot of arguments between the scratcher and the scratchee. To tackle the witch through magic often a witch bottle was utilized. They would take wine, hair, nails of the client, horseshoe nails, thorns, and pins. They would put the ingredients into a vessel which symbolized “the witches’ bladder." The witch bottle was then either put into the fire, boiled in water, or buried. It was supposed to cause the witch excruciating pain while it was being heated in order to get them to stop casting harmful spells. If a farm animal died under mysterious circumstances, the cunning folk would suggest the client remove the dead animal’s heart, stick it with pins, roast it, or hang it inside of the chimney. This was supposed to “burn the curse away." All of these interesting methods were utilized, but the most common cure for a curse was a written charm or an herbal remedy. The herbs used were kept secret by the cunning folk and rarely written about, but we can assume they used the same herbs as the popular mystical physicians of the time. In the subject of herbal medicine and the mystical properties of herbs Nicholas Culpeper’s book “The English Physician and Herbal” was very influential from the 1800s and onward. In it he writes, “bay is the best herb, it resisteth witchcraft very potently, as also all the evils old Satan can do to the body of man.” The cunning folk would write on paper a simple charm or prepare a small bag with certain herbs to be worn around the neck. I especially like to use little charms like this for simple magical assistance. All of medicine back then was based on the four humors of the body which are black bile, yellow bile, phlegm, and blood. This cosmology got some things right, but medicine was still in its early days. For the beginning part of the early modern era the cunning folk’s medicine was often as good or better than what an actual doctor could prescribe. Compared to orthodox doctors, many cunning folk also showed exceptional customer care. They often travelled for clients, made night calls, and offered to stay days at a time if need be. One cunning man travelled twelve miles by horse to see an elderly man, sat up with him all night, and went to morning prayer with him the next day. A cunning man called Mr. Teare said about his customer care, “The crab who hides away in his hole is never fat." To further amaze their customers and build their reputation many cunning folk dressed in eccentric clothing and decorated their showrooms to look magical and exotic. (Some also dressed in regular clothes.) One cunning woman had dried herbs hung from her ceiling and a stuffed dried lizard on a table. During consultations she wore a conical hat and a shawl scrawled with magical signs and symbols. Folk magic of the cunning folk variety didn’t end in Europe; Germans and English settlers transported practical magic and herbal remedies to America later on, and these practices soon expressed their own unique styles. Among some of the American cousins of the cunning folk’s practices are pow-wow, granny-magic, and even hoodoo contains some unmistakeable European elements. At the end of this brief entry on folk magic and history, we can take a look at spiritual businesses today-- psychics, mediums, healers, shamans, and professional spellcasters-- and we can see many commonalities with the cunning folk. In the past people needed clarity and confirmation in their life that they received from those with a special gift or spiritual knowledge, and it is the same today. It is the same just as it has been throughout human history. Whether a wise-woman, a shaman, or a medicine-man, people have always sought out those with a mystical insight to part the veil between the known and the unknown. It is my belief that humanity has truly never stopped believing in the beneficial magic of nature and the mind, but that the face of that magic only shifts gradually with the passage of time. By learning about the spirituality of the past, we can more fully understand the spirituality of the present. This winter has been a memorable one which I will always cherish. I am closer to my loved ones than I have been during the past several years. My relationships and friendships are growing stronger. I am feeling confident and happier than I have in the past. And I am looking forward to a new year of promise, love, and celebration. I wish you all many blessings as well.